Throughout history, Earth's climate has continuously experienced slow natural swings between being virtually ice free and being almost totally covered in ice. Today, we are somewhere in between these two extremes. Snow and ice exist year-round near the poles and seasonally at lower latitudes. Glaciers cover about 10% of Earth's surface and can be found on every continent except Australia. Glacial ages come and go over millions of years. Interglacial periods, like the one we are in now, are typically spaced apart by hundreds of thousands of years. However, since the industrial revolution, increased carbon dioxide (CO2) levels in the atmosphere, largely due to the burning of fossil fuels, are pushing Earth toward a warmer climate. Like sea ice, land ice plays a significant role in maintaining Earth's energy balance by reflecting solar radiation back out into space. Glaciers and ice sheets also store about 75% of the world's fresh water (NSIDC, 2013), which makes them vital for human survival. In the first part of this Lab, you will learn about how glaciers form and the different processes that contribute to glacial mass balance by using an online interactive to explore how glaciers provide scientists with evidence of climate change. 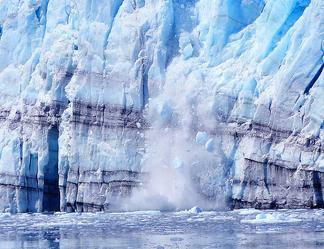 In Part B, you will learn about how & why glaciers move. In Part C, you will make a model of a glacier out of a putty-like substance called gak and conduct a hands-on experiment to explore glacial movement.